Every July, since 2007, about 25 pediatric pulmonary hypertension (PH) patients experience a summer ritual most kids with the disease only experience through movies and television. They go to summer camp. PH is incurable and life threatening, as it can lead to failure of the right side of the heart as it pushes hard to get blood through arteries in the lungs narrowed by the disease. Without treatment, the average survival time is 2.8 years with symptoms that include shortness of breath, fatigue and fainting. PH too often looks like asthma or other less threatening illnesses. 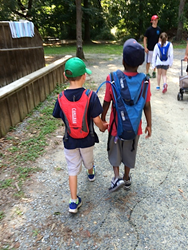 With bags and backpacks stuffed with enough portable oxygen tanks, infusion pumps and oral medication to last a week, the lucky PH campers live in dormitories at Echo Hill Outdoor School (EHOS) on Maryland’s eastern shore. Echo school staff teach classes in ecology, history and nature, guiding campers through exercises in swimming, zip lining, canoeing, dancing and other physical activities kids with PH believe to be off limits for people with their condition. The 2015 camp takes place from July 27 – August 1. About a dozen healthcare professionals, including physicians, nurses, therapists, psychologists, most of them colleagues of Dr. Hanna at Children’s Hospital of Philadelphia, donate vacation days to serve as volunteer medical staff at the camp. They administer regular daily treatments, monitor the campers’ health, deliver emergency care when needed, and provide necessary psychological support. Families learn about the camp from transplant centers and family support groups offered through the Pulmonary Hypertension Association (PHA), the nation’s leading PH nonprofit, which provides support for patients and their caregivers; medical education for healthcare providers; awareness programs; and funding for research to find ways to prevent and cure PH. PHA-funded studies include work that could lead to treatments designed specifically for children with the disease. While there are 12 PH medications, none is approved for pediatric patients. Headquartered in Silver Spring, Md., the Pulmonary Hypertension Association (PHA) is the country's leading pulmonary hypertension organization. Its mission is to find ways to prevent and cure pulmonary hypertension and provide hope for the community through support, education, research, advocacy and awareness. PHA does this by connecting and working together with the entire PH community of patients, families and medical professionals. Among its programs, PHA facilitates more than 245 support groups around the country and delivers continuing education for medical professionals through PH Online University. For 12 consecutive years, PHA has received the highest rating—four stars—for fiscal accountability and transparency from Charity Navigator, placing it in the top one percent of all rated charities. For more information, please go to PHAssociation.org. The EHOS Heart Camp residential program invites campers, between 8 and 17 years of age, who heart and/or lung transplant patients and children with Pulmonary Hypertension. Camper eligibility is determined upon recommendation by a pediatric cardiologist and approval by the camp’s medical director. The actual cost of Camp is $1100, but the only charge to a camper is $50. For more information, including ways to support the effort, please go to http://www.EHOS.org.